Jaipur, 9 March: Jawahar Kala Kendra is set to host the second edition of its performing arts festival, Navras. Spanning over a period of 9 days from March 18 to 26, the festival will present a series of rich and diverse productions of theatre, contemporary dance and Sufi, classical, pop and fusion music. The varied programme has been put together, keeping in mind the interests of the audience. The idea, is also to give the audiences the chance to experience the arts and its impact in a range of spectacular spaces within the JKK premises. The festival will open on 18 March with a performance by noted singer Shubha Mudgal and her band Koshish. Equally at ease with popular music and fusion projects, Shubha Mudgal is one of India’s acclaimed vocalists who has specialised in Hindustani classical music. The days that follow will witness many artistic presentations including dance productions – Ganapati by Adishakti and Timeless by Aditi Mangaldas Dance Company, theatre productions – Kaumudi by Abhishek Majumdar and White Rabbit Red Rabbit by Nassim Soleimanpour, and music – sufi Kalam by Zila Khan and classical by Shruti Sadolikar and Vidya Shah. The premier of Phool Kesula Phool, a theatre production commissioned by JKK and directed by Rajasthan’s bright talent Rajendra Panchal will also be hosted during the festival. Last year JKK had invited proposals from theatre directors of Rajasthan and Panchal’s proposal was selected out of 40 such proposals. JKK will also be presentingTilchattey ki Diary, a play for children that was also commissioned in summer 2016. Key to this year’s programming is a shift from proscenium based theatre. In an attempt to introduce the audience to alternative viewing strategies, several experimental productions have been invited to Navras. For example, inWhite Rabbit Red Rabbit there is nothing between the actor and the audience – no directorial vision, no production design and no technical histrionics. The script is handed over to the artist on the stage and s/he then has to improvise and make it interactive; Dil -o– Danish, a long durational reading of Krishna Sobti’s celebrated novel about Delhi and the Ganga-Jamnitehzib of the city will be held in a specially conceived tent outdoors and as the audiences immerse themselves in the story of Delhi they also taste‘Dilli ka khaana’which will be served as a part of the reading. Directed by Anuradha Kapur this work borders between theatre and a reading. The Legends of Khasak directed by the dynamic Deepan Sivaraman, is a bold and independent adaptation of the famous Malayalam novel KhasakkinteIthihasam (The Legends of Khasak) by O.V.Vijayan, which acquired the stature of latter-day mythology. 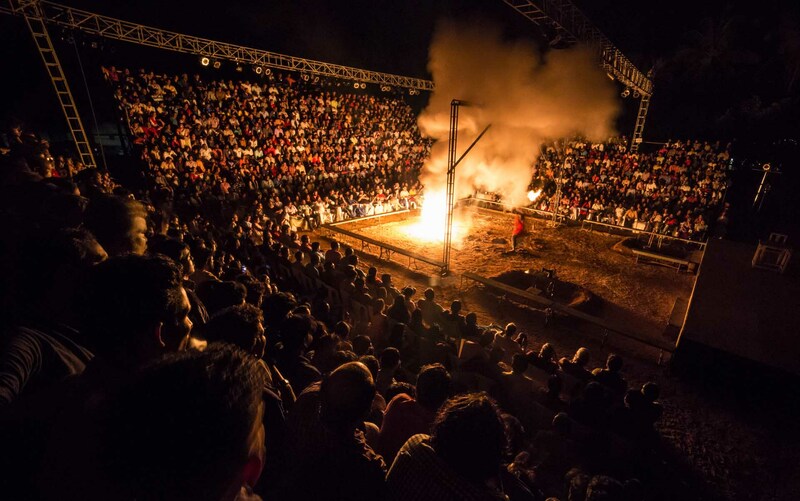 Set up in an open-air arena on a large rectangular pit of loose earth with extensive use of fire, soil, water, scent, sky and a symbolic use of huge realistic puppets and masks that allow audiences to participate and experience the pleasures and tragedies that engulf one in “Khasak”, this piece of theatre has created waves across the country and we are delighted to bring this large production to Jaipur. In addition to the various performances above, there will be a small food court offering local food and a session of‘Meet the artist’ where the artists will interact with the audiences and media. An exhibition, ‘Women on Record’ curated and designed by Parthiv Shah on 26 March. The exhibition which will run in the Museum Galleries 2 and 3 till the end of April. It is a showcase of the world of incredible women of the black and white era, of the Salon, the Tawaifs, stories, riddles, anecdotes, photographs and songs…The beginning of the world of entertainment of the gramophone era. This will be enunciated by a performance of classical music by Vidya Shah . On 27 March, “The Theatre of Alkazi” exhibitioncurated by Amal Allana and designed by Nissar Allana will open as part of the Rajasthan Divas Celebrations and World Theatre Day. The exhibition will continue till the end of April in The Contemporary, JKK Museum Galleries. The exhibition is being supported by the Department of Tourism, Government of Rajasthan. Navras 2017 is also being supported by The Hilton, Jaipur as hospitality Partner. Navras was launched in 2016 with music, dance and theatre programs spanning over a period of 8 days.